With Showbus 2016 just around the corner it is an opportune moment to share this photo of Bedford SB 58898 which carries Duple Vega C41F body number 1090/7. This lovely example of this classic combination was new to Burton Coaches, Haverhill in March 1958 but preserved in the livery of Premier-Albanian Premier Coaches, Watford (see below). Exhibit 608 at Showbus 2015 and entered by Ted Hewitt, the coach shows some seats reversed just behind mid-coach. A minor correction, but the livery is that of Premier Coaches (Watford ) Ltd. Albanian coaches of St.Albans was taken over by Premier in the early 1960’s and the Premier Albanian name first appeared on later style Duple bodied Bedfords. The current seating capacity of LGV 994 is 31 and 2 tables (retained from a 1960’s Duple from the fleet). Originally a 41 seater (as were all such examples in the Premier fleet), only 31 could be repaired to a suitable standard using the original moquette. LGV will not be at Showbus next weekend, but is scheduled to make an appearance at Amberley museum instead. Many thanks for the additional information Ted. The coach is a credit to you. 243 CUR was new to Premier in 1958 and carried the same body detail as LGV 994 (other ‘butterfly fronts’ in the fleet differed in window and light detail). When liaising with EFE, it was decided that the model should carry the authentic registration rather than LGV, as at that time the latter was in a very poor state at the back of the garage. Interestingly 243 CUR survives with a private owner having spent a large part of its life as a mobile home. LTA 904 was new to Southern National and joined the Premier vintage fleet from Rover of Chesham. 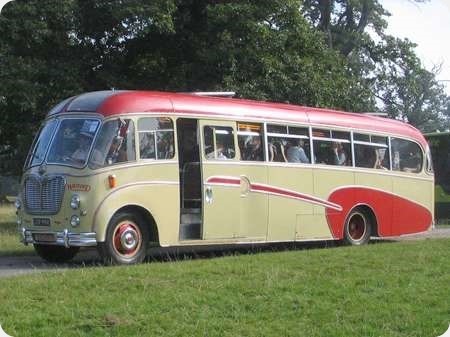 It performed film, wedding and excursion duties alongside Leyland PS1/Burlingham bodied ENT 778. My name is Susan Richardson and my father is Barry Richardson. Our family business was Burton Coaches (Haverhill) Ltd, started by my Grandfather approximately 1949. My Dad has very fond memories of this particular bus – He took his test in it and drove it as a young man. Well, my Dad is 74 in June this year, still bus and coach crazy and still has a PSV licence ! Dad and I are still in Haverhill! My fingers are crossed that someone can help me in my quest! There is a Ted Hewitt involved at Premier Coaches which is in Northwood Rickmansworth, about 80 miles from you. I haven’t found a Tel no or email address. If you go on the Companies House website and search under company officers for Edward Robert Hewitt you will find his address in Chorleywood. The owner is indeed Ted Hewitt & I have put Suzie in touch with him. A very nice move, John W. Congratulations.